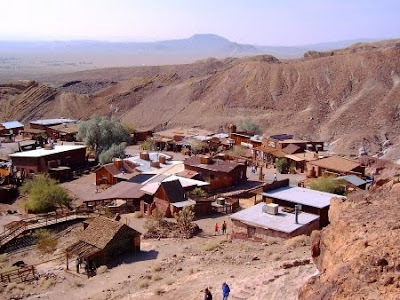 Visitors at Calico Ghost Town in the Mojave Desert geomorphic province are treated to an authentic old mining town complete with bars, melodrama theatres, staged gunfights, and portraits in oldtime clothing. They may even learn a bit of genuine history of the old silver mining district from the occasional sign. 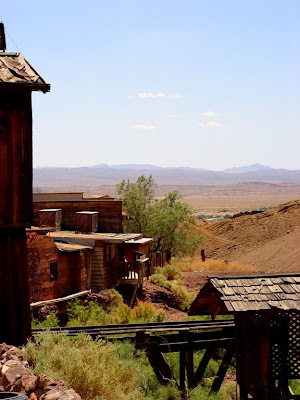 Calico is California's Official Silver Rush Ghost Town (discussed in a previous post), and is definitely worth a stop, but not necessarily for the reason envisioned by those who run the park. The parking lot sits in the gulch below the town, and exposes some of the finest folds to be seen anywhere. 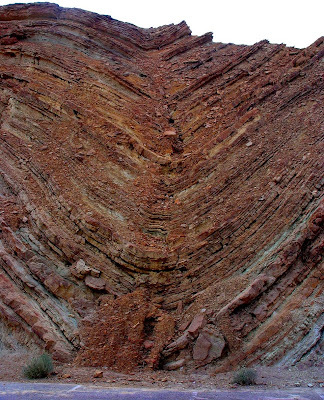 They have appeared in many geology textbooks ("textbook examples" of anticlines, the upward pointing folds, and synclines, the downward pointing folds). 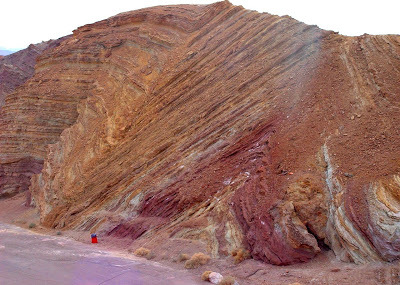 The origin of these folds has been the subject of much discussion, but their proximity to an active transverse fault (the Calico fault) suggests they developed as a result of transpressional stress. Place a sheet of paper flat on a table, and put your palms on each end. Moving one hand towards you and the other away from you will cause crumpling across the middle. Those crumples are transpressional folds. A bit farther to the west, the Barstow Formation is exposed at Rainbow Basin Natural Area, administered by the Bureau of Land Management. 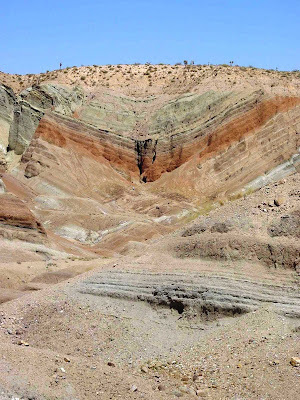 An upside-down rainbow, the Barstow Syncline, is one of the most striking features. I talked about the area in a previous post. In a marked contrast to the volcanic rocks that make up the core of the Calico Mountains, the Barstow layers are sedimentary rocks. 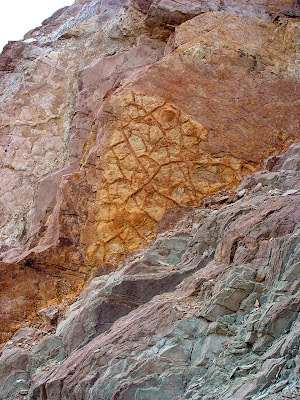 Sedimentary structures such as mudcracks (below) and ripplemarks indicate that the sediments accumulated in a faulted basin in a moderately tropical and occasionally arid environment, essentially similar to the African Savannah of today's world. It was a world of grasslands and palm trees that existed between 13 and 19 million years ago, based on radiometric dates of volcanic ash layers that bracket the sedimentary strata. An African savannah. Visions of elephants, giraffes, zebras, and rhinos. But not in America, right? Well, time for a new vision. The most stunning aspect of the Barstow Formation is the diversity of fossil species found in its layers. Numerous species of ancestral horses and camels, a rhino ancestor (Aphelops), and an early elephant called a gomphotherium (similar to those big elephants in the Lord of the Rings movie, only much smaller) are among the discoveries. Feeding on these planteaters were one of the earliest cats (Pseudaelurus), an ancestor to the coyotes (Tomarctus), and a probable forebear to the bears and dogs called an Amphicyon (pictured below). The extreme diversity of the fossil assemblage, and the fact that the formation is well-dated led to the establishment of a portion of the geologic time scale called the Barstovian stage of the Miocene epoch, referring to the time period from 16.3 to 13.6 million years ago. One further aspect of the fossil record in the Barstow Formation are calcareous nodules that contain nicely fossilized insects. Insects are rarely preserved as fossils, but the bugs in the lake sediments were replaced by silica and were supremely preserved, to the extent that even leg hairs are visible. A nice slideshow about the Barstow Formation and the fossils it contains, from the San Bernardino County Museum. This has been an entry in the series on the Other California. My latest project is an exploration of the geologically interesting places in California that don't always show up on the postcards. I'm probably going to be on this for awhile, and I'm needing a page where I can keep track of what I've done so far. If you've followed my blog at all, you know I have a type of Geologist Attention Deficit Disorder Syndrome (GADDS), that as soon as I start concentrating on one subject, something interesting pops up somewhere else, and I explore it for a few weeks, and then get distracted again. The Other California: Now This is a Postcard! : A brief overview of the geology of the state as it is represented on geologic maps and and introduction to the idea of provinces. Although the original idea came with a post about California's prairie lands, I pretty much first started out by describing the geologic significance of some of our state symbols. 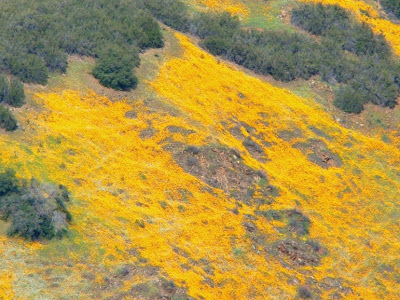 The Other California: Already Off on a Tangent: A review of the familiar symbols, the Golden Poppy, the California Quail, the California Grizzly Bear, and our state mineral, Gold! The Other California: Geology and our Other State Symbols: A look at the state mineral, the state rock, and the state gemstone, the one hardly anyone has heard of. The Other California: Geology and the other State Symbols III: a look at our state fossil, the saber-tooth cat Smilodon Californicus. The Other California: Geology and the other State Symbols IV: California has some unique Gold Rush-era towns, but nothing is quite like Bodie, off in the high desert east of the Sierra Nevada. The Other California: Geology and the other State Symbols V : The strange politics that led to the establishment of the official California Silver-Rush Ghost Town. Say Hello to California's New State Dinosaur, Augustynolophus morrisi: The first dinosaur discovered in California was found in our county, Stanislaus. The Prairie Lands: California has its own version of savannahs, both present and past. Sharktooth Hill: That's about it...thousands and thousands of shark teeth and a great many other species. The Sierra Nevada is the largest single mountain range in the United States, more than 400 miles long and averaging 50 miles wide. It also has the highest peak in the lower 48 states. Although composed mostly of granite, it also has large exposures of metamorphic and volcanic rocks that tell a remarkable story of traveling continents and terranes, as well as tales of violent eruptions. The Other Yosemite at Hetch Hetchy: There was a counterpart to the Yosemite Valley, but we dammed it. The Other Side of the Sierra, down the West Walker River: The West Walker River flows down the east side of the Sierra, and hosted the longest glaciers to be found on that side of the mountains. An Enigmatic Gorge, the West Walker River Canyon: A strange entombed forest, and a deep gorge with a violent geologic temper. Exploring California's Biggest Volcano: An introduction to the Medicine Lake Highland, one of California's most active volcanoes. Geologists Who Live on Glass Mountains Shouldn't....: Looking at volcanic glass, obsidian and pumice, on the Medicine Lake Highland, with a view towards the Modoc Plateau, too. Five For the Price of One: California's most prominent volcano is really five volcanoes, with a violent past. A Mystery Solved, and One of California's Prettiest Little Waterfalls: McArthur Burney Falls is California's second oldest park, and is one unusual waterfall. Getting all excited about natural disasters: an eyewitness account of some of the events surrounding the 1914-15 eruption of Lassen Peak. The Modoc Plateau is a high flat region underlain by thick flows of basalt lavas in the remote northeast corner of the state. 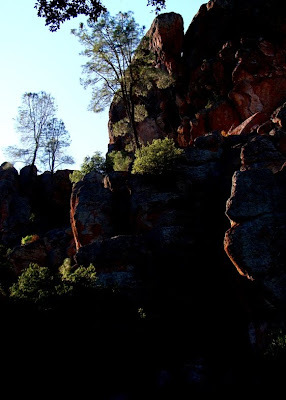 It is one of the least-known areas of California, but has some nice geological surprises. California's Biggest Volcano: here is the first surprise; the biggest volcano is not named Shasta or Lassen! Cries From the Past: A tale of rebellion, resilience and betrayal; the Modoc Indian War of 1872-73. And why armies should study geology before fighting wars. In northwest California, a series of mountain ridges reveal stories of continental and oceanic fragments that were crushed into the western edge of North America. The rocks bear a close resemblence to the Sierra Nevada, although they are offset more than sixty miles. Flotsam and Jetsam: An introduction to the Klamath Mountains as a series of accreted terranes, tracts of crust and old ocean floor that traveled hundreds or thousands of miles. I've seen these mountains before! The Big Ripoff: Viewed on a geologic map, the Klamath Mountains look like a continuation of the Sierra Nevada, but lie sixty miles farther west. 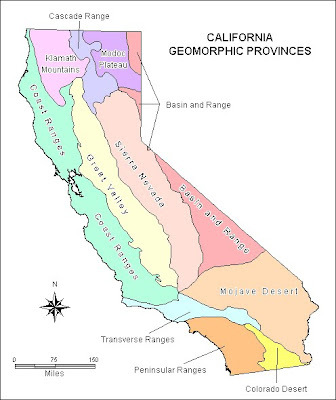 The series of mountain ranges that roughly parallel California's coastline are one of most diverse areas of the state from a geologic standpoint. There are thick sequences of sedimentary rocks including the Great Valley Group and elements of the Franciscan Complex, and there are plutonic and metamorphic rocks of the Salinian Block (and parts of the Franciscan). There are even volcanic rocks and potentially active volcanoes. Dammed if we do Dam, Dammed if we don't Dam: An unusual reservoir without a dam, Topaz Lake stores Walker River water, but has great fishing too. Why is it there? Damned if we do Dam, Damned if we don't Dam: A slightly modified name, and a much bigger issue - What are we going to do about Walker Lake? It's dying. It's also in Nevada, but it is a California river. The Calico Mountains: An exploration of a unique mountain range, well beyond the confines of the tourist trap ghost town. Caught in the Vise (the Western Mojave Desert): A discussion of complex fault relationships in the western Mojave and another chance to show some wildflower shots. 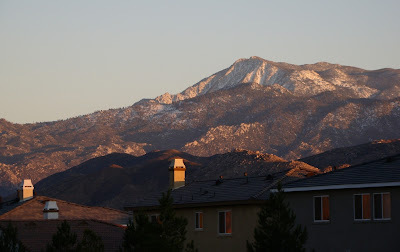 The Other California: Another Friday Fun Foto: A brief introduction to San Jacinto Peak, the highest mountain in the Peninsular Ranges, and one of the most prominent mountains in the state, with a 10,000 foot slope in one area. I clearly have lots of ground to cover, and will update this page as necessary. Nothing of great consequence, but I got some pictures on our holiday journey that I wished I had a few months ago. 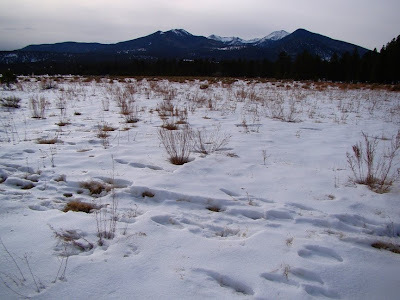 Our road took us through the San Francisco Peaks Volcanic Field, which I discussed in my series on the geologic history of the Colorado Plateau. I had a post on the volcanoes, but my photo archives revealed hardly any usable shots of the San Francisco Peaks (I borrowed some photos from the USGS). As we drove from Grand Canyon to Flagstaff on Highway 89, we passed the massive stratovolcano, topped by Humphreys Peak, which at 12,643 feet is the highest point in Arizona. The mountain, seen above, has a massive east-facing basin that may have formed in the same explosive manner as the crater at Mt. St. Helens. Prior to the destruction of the peak, it may have been the highest mountain in the contiguous United States, at something over 16,000 feet. The meadow in the foreground lies along the entrance road to Sunset Crater National Monument, which preserves one of the youngest volcanic features in Arizona. 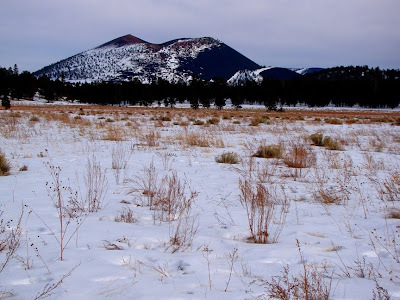 A look east from the same meadow reveals Sunset Crater itself. The crater erupted over a period from 1040 to 1100 A.D., and disrupted life for some of the Ancestral Pueblo/Sinagua people who lived in the area at the time. The monument is a marvelous place to see evidence of recent basaltic volcanism, and adjacent Wupatki National Monument is one of the most spectacular places to see evidence of the ancient Sinagua people. The answer to the first Friday Fun Foto has been appended to the last post, and several people got it right away here on blogger, and on my facebook note (very sharp). California's people have some absolutely spectacular, world-class mountains quite literally in their backyards. Take today's Fun Foto. This mountain peak is the third most prominent mountain in the state, and at one point has a vertical relief of 10,000 feet in a distance of only five miles or so. It is also the highest peak of an 800 mile-long mountain chain. And I bet an obscene number of the many thousands of people who live in towns at its base cannot name it! What mountain is it?? UPDATE: Coconino is correct, this is San Jacinto Peak, which at 10,834 feet is the highest point in the Peninsular Ranges, which reach to the southern tip of Baja California. The mountain is an alpine island rising more than 10,000 feet above the desert communities of Palm Springs, Palm Desert, Thousand Palms, Banning, and Beaumont. At least one tourist stop has made the mountain famous, the Palm Springs aerial tramway, that whisks people to more than 8,000 feet above the city. It was meant to be a winter ski resort, but the peak came under the protection of the state and federal park systems to preserve its wilderness character. The Other California: A Friday Fun Foto! Here's hoping your holiday was a "transformative" experience! In honor of the concept, I present a Friday Fun Foto: What mountain is this? A couple of clues: It is the southwesternmost peak in the United States that shows evidence of Pleistocene glaciation, maybe even the southernmost, period, and also has the southernmost grove of Aspen trees in the United States. As far as the "transformative" part, in the picture above, not one, but two strands of the San Andreas fault lie tucked between the ridges visible in this photograph. Merry Christmas and happy holidays to all! Thanks to Susan Hayes for the photo. UPDATE: As Chasmanian Devil and Forrest noted, it is San Gorgonio Peak, the highest mountain in Southern California at an elevation of 11,499 feet. The mountain shrunk three feet over the course of my life, as I grew up in SoCal with the highest point being officially 11,502 feet. It got too heavy, or else the surveying methods improved! 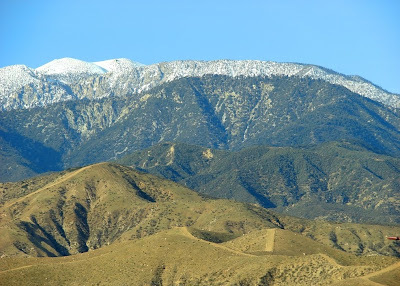 San Gorgonio is a fascinating place to hike, especially if you like wilderness: many people follow the trails to the summit, but some wonderful lonely trails explore the flanks of the peak, especially at the headwaters of the Whitewater River. It was glaciated in the Pleistocene ice ages, and recent research has established the precise glacial chronology. It even has a few natural lakes, a rarity in southern California mountains. It's a place I am anxious to get back to! I highly recommend a book by Stephens Press called Call of the Mountains, a beautiful photo-essay about southern California's mountains. The sky turned yellow and dark today in Casa Grande, Arizona, near the metropolis of Phoenix. A major winter storm was blowing through the desert, and as we left Tucson the wind was already whipping up. By the time we reached Picacho huge billowing clouds of yellow dust obscured the freeway. It was a dangerous day on the road. A chain reaction accident involving 13 cars and 9 trucks killed three and injured many others. A fire had started, and when we passed the scene a few hours after the crash, the trucks were still smoldering. A second chain reaction involved a dozen cars or so, and happened only a few minutes ahead of us on the highway. It was a stressful day for us, and a tragic day for some. My heart goes out to those who lost family members in the accidents. Dust storms are a normal phenomenon of deserts, but they are made worse by poor agricultural practices and droughts. According to news reports, the worst dust of this particular storm was the result of plowing in nearby agricultural fields. I find myself wondering if the agribusinesses take high winds into account when they plow potentially dusty dry fields near major transportation corridors. 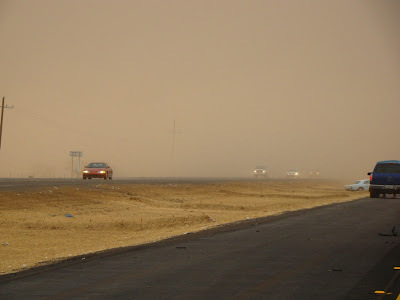 A sign on a highway warning of dust is too easily ignored, and does not absolve those responsible when things go terribly wrong. This sort of tragedy is too common in the Phoenix region, as well as back home in the Central Valley. In geology, scale is everything. We have a hard time understanding the meaning of a million or billion years when our own personal experience extends across only a few decades. A place like the Grand Canyon seems immutable and unchangeable in a human time frame, but it is simply spectacular what can happen on a time scale of five or six million years. An entire gorge, one of the largest on the planet, can be produced by nothing more than a river flowing and gravity pulling rocks from cliffs. A zoom lens can serve as a metaphor for human existence in the midst of deep time. It has been my experience that when I look upon a scene of such grandeur, my mind is not fully capable of taking in the true scale of the canyon. The vastness of the scene has been shrunk to a single image in the back of my eye, and my ego makes me much larger in relation to the canyon in front of me. One way to gain a truer sense of scale is to hike the canyon. Nothing drives home the depth of the gorge more than trying to walk back out. It looks a LOT bigger when you stand at the bottom and look up! On the other hand, one can stand on the rim with a camera, and see what happens to people scaled to the immensity of the canyon. 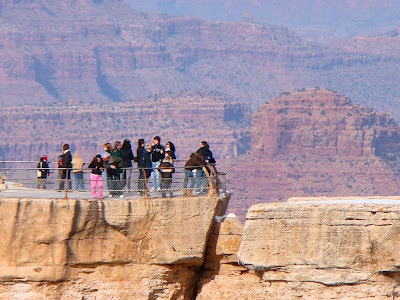 I stood this morning at Mather Point and snapped a shot of people enjoying the view (above). I was actually some distance away, using a 30x zoom, so I back out to 15x or so, and a strip of the Kiabab Limestone becomes visible. The rock is a mixture of limestone and sandstone that formed in a shallow sea in Permian time, around 250 million years ago. Zooming out to 7x or so, the cliff grows in size, and the tourists are shrinking into insignificance. The cliff they are standing on is a few hundred feet high, but the real news here is the far rim of the gorge. Do you see the double layer of light colored rock separated by a forested slope? That thin whitish strip across the top is the same Kaibab Limestone! 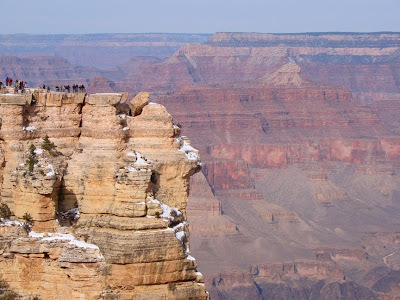 It is one of the thinner layers that makes up the cliffs of the Grand Canyon. I was about a quarter of a mile away from the people at the viewpoint, and without a zoom they are practically invisible on the upper left. The canyon is ten miles wide, and more than a mile deep. We humans are mere insects in the face of such immensity. The existence of human civilization over the past few thousand years fades into an equal insignificance over the immensity of geologic time. The rocks in the deepest part of the canyon are more than 1.7 billion years old! I want to pay a compliment to the National Park Service. I was most pleasantly surprised when we arrived at Mather Point this morning. 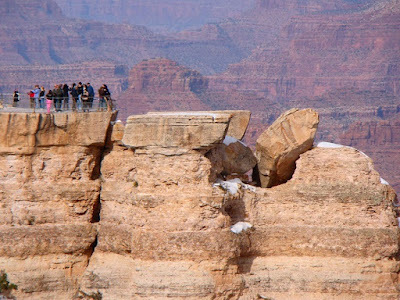 For years, Mather Point was the spot where the majority of visitors saw the Grand Canyon for the first time. There was a crowded parking lot, always noisy, always kind of trashy. It got worse when the NPS completed the new visitor center a few years ago, because Mather was the closest parking lot and consequently the competition for parking spots increased. It was an untenable situation. When got there today, we discovered a new parking lot and a realigned highway that diverted traffic away from the rim (completed in November). One could park at the visitor center, and take a two minute stroll to see the canyon for the first time. No trash, no noise, just a beautiful rim walk with the silent immensity of the canyon, and the occasional croak of a raven. The people I saw looked reverent instead of hassled. It was a moment of rediscovery, and I want to thank the park service for a job well done. A few weeks ago, Pascal at Research at a Snail's Pace provided an in-depth look at a GSA field trip to Mount St. Helens led by young-earth creationist (YEC) Steve Austin. It has five parts, and is well worth your time, especially on issues relating to the quality of research being presented as abstracts at GSA and other organization meetings. As is well-known, abstracts cannot undergo the kind of rigorous peer-review that is typical of published journal and research articles, and this is how it should be, as often they deal with preliminary results and controversial new ideas. Yes, the YEC crowd will put this as a shining feather in their caps [ironic, since they claim all of our work is wrong yet they view interaction with us as "proof" that their ideas have merit]. The "feather in the cap" has been published by the Institute of Creation Research, and it has some interesting perspectives. I am mostly struck by the way the ICR crowd feels it must hide its motives in their abstracts and field trips. Sure, being labeled a young-earth creationist at a GSA meeting would lead to perception problems, but labels have a reason sometimes. I often start my classes with the statement that "recent research" indicates that cigarettes don't cause cancer after all. The students catch on pretty fast and ask "who did the research, and who paid for it?" They understand that if the research was presented by the tobacco lobby, that's one thing, but if it was published in a peer-reviewed journal by oncologists supported by the American Cancer Society, that is something else altogether. Two of these papers were on the petrology of the Coconino Sandstone of the Grand Canyon... (the) Authors ... presented evidence that ocean water, not wind, deposited the distinctive crossbedding of the Coconino Sandstone. The evidence of ocean water currents was argued technically from the dolomite beds, dolomite grains, ooids, mica grains, microfossils, and bimodal texture. The Coconino Sandstone in the Grand Canyon region is a real problem for young-earth creationist, as are most of the other sedimentary layers on the Colorado Plateau. By their "model" (giant world-wide flood 4,500 years ago), all 12,000 feet of the sedimentary layers of the region HAD to form in ocean environments and under extraordinary conditions at that. All of them. If one of them clearly formed on land, then their "model" is disproven. So the Coconino, generally recognized as a desert sand-dune deposit, had to form underwater. So ask yourself: would these people EVER find evidence of a land-based origin for this layer, or any other layer for that matter? Their researchers must agree with ICR doctrinal statements and tenets just to do research for ICR. Christian geologists also expressed themselves through an organization within GSA called Affiliation of Christian Geologists. Around 40 GSA members attended the evening meeting ... approximately one third of whom were young-earth creationists. This shows that there are many within the GSA that take seriously the creation and Flood narrative text of the Bible. Their numbers and prominence within GSA appear to have been growing over the years (italics mine). If you peruse the ACG website, it is apparent that they are reputable geologists who have serious issues with the young-earth creationists. I also have a slight problem of calling the 13 or 14 young-earth creationists "many" when compared to the thousands of geologists in attendance at the meeting. 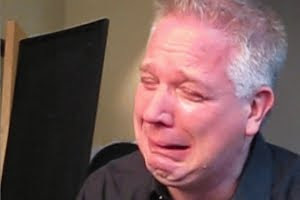 I don't think creationists should be excluded from venues like GSA. On the contrary, I wish they would present more of their "research". But I would hope that their work will receive the same scrutiny that any poorly designed research would get. If they are trying to prove a worldwide flood 4,500 years ago, then present the evidence to the people who know the science, and be ready to get challenged. Don't hide your motives. 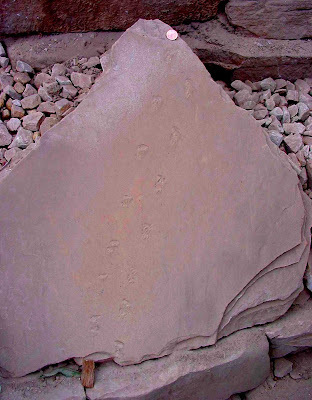 Today's photo is a slab of the Coconino Sandstone showing trackways of an animal walking across the surface of the sand dune. Several dozen different kinds of tracks are commonly found in the unit. Holiday greetings to everyone! We're on the road to various locations in Arizona and Southern California, so posting might be sparse the next few days. 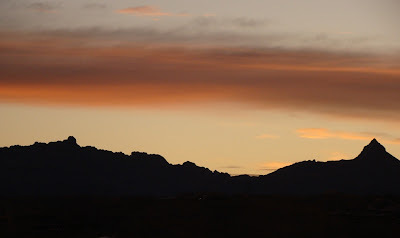 Having done several posts on the Calico Mountains, I realized I had no distant shots of the mountains, so I snapped a couple from Highway 40 outside Barstow. 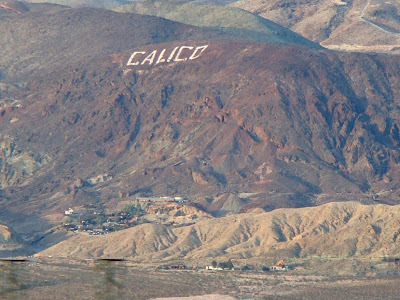 Calico makes its presence known with the logo across the mountaintop. The actual village is at the lower left, behind the light-colored foothills, which are composed of the Barstow Formation. The Calico fault zone passes behind the hills as well. More on the Barstow in a future post. The red and gray rocks making up the core of the mountains are late Miocene volcanic rocks. The sunrise is courtesy of the fourth floor of Harrah's in Laughlin. I love the mountains in the vicinity, which are composed of rhyolite tuffs, but I don't know the age. I try to spend more of my time outdoors while taking advantage of cheap rooms and meals! It seems like gold has been appearing everywhere of late, especially in those late-night commercials that ask you to pick up any loose gold that happens to be lying around the house, put it in an envelope, and send to those very nice sounding people who will send you a check for your trouble. The guy is strumming a banjo; how evil could he be? And I am absolutely sure they pay top dollar to the people desperate enough to fall for the scam. 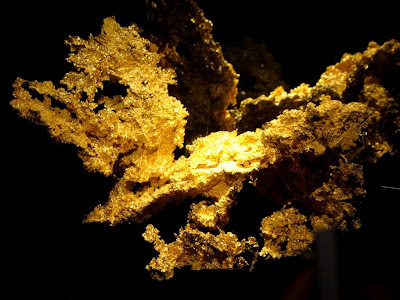 I started thinking about gold because one of my very first efforts at web page design (1997, I think) still sits in a largely original state on my school website, a discussion about the history of the gold mining in the Mother Lode. It talks about the value of gold at the time, and the then current state of mining. A recent visitor to the site commented the price of gold had quadrupled since I wrote the piece, and suggested that interest in mining was up again (if you check out the site, be aware that some of my numbers are speculative). First off, does anyone know of any ongoing interest in reopening any Mother Lode mines? I'd like to know about it. I must say, that if I were already operating a mine, I couldn't be happier. Great prices! But opening, or reopening a mine? Do mining companies trust that the price of gold is going to remain stable or continue to rise? Enough to make the incredible investments in equipment and regulatory paperwork? I've gotta say that the run-up in the price is very reminiscent of the dot.com craziness of the 1990's, the stock market craziness of the 2,000's, and the real estate insanity of the last 10 years. Wow...how'd they all do? What I remember the most was the maniacal exhortations to invest, invest, invest, even as prices started to fall. Late Add: Seems (surprise, surprise!) that some of those commercial gold buyers have gotten in trouble. Check out this report. Three weeks were spent on the Hawaiian Islands, an absolutely glorious journey with enough sights (and pictures) to last a lifetime. Here, Halemaumau crater on Kilauea is belching out tremendous amounts of sulfur dioxide and other gases into the atmosphere. The eruption began only a year or so earlier, with a vent 300 feet across and 600 feet deep. Lava is bubbling inside. A July trip to Balboa Beach in Southern California saw the arrival of unusually large waves from a tropical storm off Baja. A couple of people were actually killed by them. 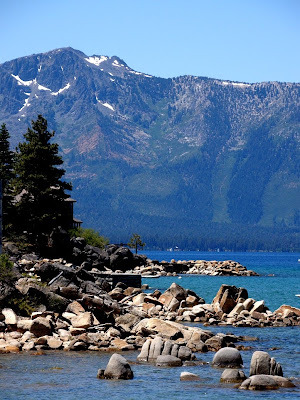 July also saw a trip to Lake Tahoe, the giant subalpine lake (1,700 feet deep) formed as a huge fault valley (graben) was dammed by lava flows. Mount Tallac, on the skyline, is composed of metamorphic rocks intruded by Mesozoic granitic rocks. September included a field studies journey to the Cascades of Northern California and southern Oregon. We toured Mt. 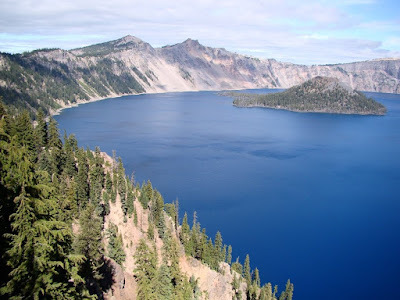 Shasta, Crater Lake (above), Lava Beds, and Lassen Volcanic National Park. 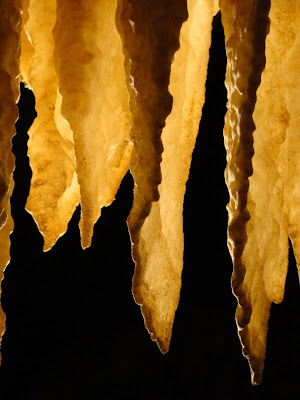 October was a field studies trip to the central Mother Lode, including an exploration of Black Chasm cave. November included a tour of Pinnacles National Monument (above), and a Geology Club tour of Natural Bridges near Columbia in the Sierra Nevada Mother Lode. 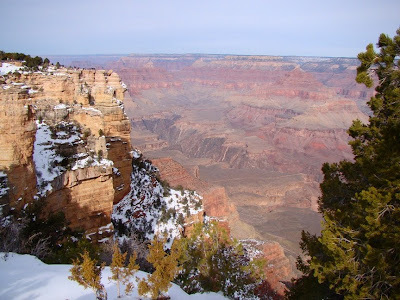 And for December, a lot of family, and a quick look at the Grand Canyon! In February, it was our field studies trip to a rather snowy Death Valley National Park. 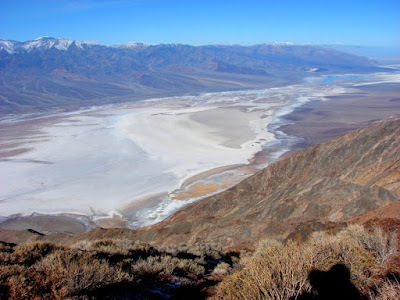 From Dante's View, one looks down a vertical mile to the lowest point in the western hemisphere, near Badwater (-286 feet). By March, the Sierra Nevada foothills were blooming; these are poppy fields in the Merced River Canyon, seen during our field studies trip in the southern Mother Lode. Didn't do much in May, because we were planning our biggest trip of the year, a field study of the Hawaiian Islands. 25 students joined us on an exploration of the Big Island, Maui, and Kauai. 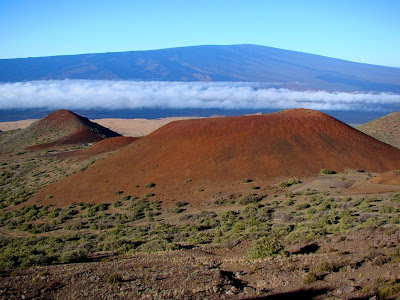 Below, a view of Mauna Loa from the flanks of Mauna Kea, at 9,000...which is cold in the morning! More in a moment! Part II is here. 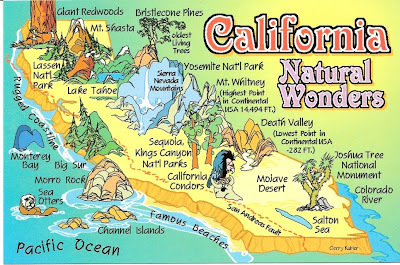 I am doing a series of the kinds of geological places in California that don't appear on all the postcards, but which would be major attractions in any other setting. The Calico Mountains fit the bill in a way, because despite the fact that Calico Ghost Town is a major tourist destination, and a symbol of the state of California, there is a geological richness there that the vast majority of visitors never see or realize. The Calico Mountains rise to the northeast of the town of Barstow, just a few miles off of Interstate 15 on the way to Las Vegas. The Ghost Town lies on the south flank of the mountain, and as mentioned previously, it was California's most important mining center for silver, with a rich resource of borates minerals as well. The rugged colorful mountains reach 4,542 feet at Calico Peak and are largely composed of volcanic rocks erupted within the last ten million years or so. The volcanic rocks intruded and erupted on top of an older series of volcaniclastic and sedimentary rocks deposited in basins in Miocene time, around 15 to 19 million years ago, which were in turn deposited on a basement sequence of Paleozoic metasedimentary rocks and other metamorphic rocks of indeterminate age (arguments range from Mesozoic to Proterozoic!). A major fault slices across the front of the mountains, the right lateral Calico fault, which provided a major avenue for hot mineralized waters to rise close to the surface. The hot spring activity produced veins of barite, calcite and agate that hosted most of the silver ores. Recent research has indicated that the region is part of a metamorphic core complex that experienced a great deal of extension in Miocene time. 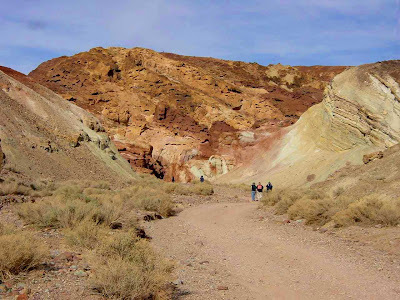 Wandering away from the tourist haunts at Calico Ghost Town can became a wonderful adventure. There are other ghost towns, actual ruins of mining camps, dozens of mines, and wonderful outcrops of strangely eroded volcanic rocks. The pictures above were taken at the entrance to the narrows of Odessa Canyon, a popular 4WD track, although I like walking it far better. The usual warnings about exploring old mines are especially relevant here; the mines follow veins and "glory holes", which means sudden drop offs in unexpected places. A cousin of mine once almost dropped a jeep into one of the mine openings (I appreciate winches all the more now). 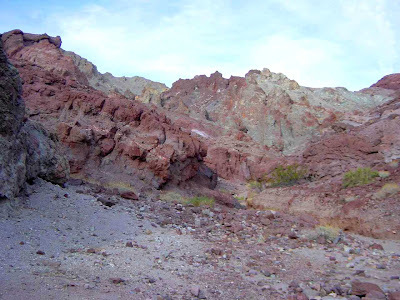 The top picture shows another aspect of the geologic history: the light colored rocks in the foreground are on one side of the fault, and the darker volcanic rocks are on the other. 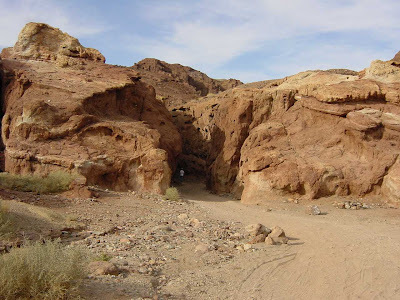 The light-colored rocks have an incredible story quite apart from silver mineralization; they are the silts and sands of the Barstow Formation, one of the most important fossil-bearing strata in California. And I'll bet not one in a hundred of the tourists has a clue what they are camping and hiking and touring on. I will discuss them in some additional detail in the next post! In a week following a fracas on our campus with a climate change denier on our faculty, and in light of new polls showing growing doubt among Americans about the existence and cause of global warming, it becomes clearer than ever the need for scientists to be more proactive about showing how the sciences and the search for knowledge work. The lay public also needs to understand the many ways in which public opinion is influenced and manipulated by carefully planned public relations efforts by companies who feel they stand to lose profitability. It has been called "manufactured doubt". On the former subject, I recommend a short note by four Yale professors describing just where we stand in our understanding of climate change. It provides a good geological perspective to charges that earth's climate has always been changing: it has, but not at the pace we are experiencing today. "However, Earth’s history has something to say about climate sensitivity and the role of carbon dioxide, as well. The reconstruction of Earth’s history reveals a story of slow and rapid climate change and clear evidence for immense variations in temperature. While most discussions in the popular press focus on the past 100 to a few 100,000 years and the precise relationship between carbon dioxide and temperature, it is informative to examine the full range of climate variations over millions of years. Earth was, in fact, ice-free for most of its history. For example, Earth was much warmer and had no significant polar ice between 65 to about 34 million years ago. Fifty-five million years ago, rapid and massive releases of carbon acidified the oceans and warmed Earth’s surface about 5 degrees Celsius above what was already a warm planet. At peak warming, about 50 million years ago, crocodiles roamed the Arctic amongst subtropical flora and fauna, even though the Sun’s intensity was lower than today. Much higher carbon dioxide during this time is revealed by various paleoclimate reconstructions, and subsequent global cooling is shown to have followed carbon dioxide decline. Earth’s history tells us that the leading driver of climate change is the concentration of atmospheric carbon dioxide. Not the only driver, but the leading one. It also reveals that climate sensitivity to carbon dioxide is possibly much higher than discussed in policy-making circles. About five million years ago, carbon dioxide was as high or only slightly higher than 2009 values, and Earth reached temperatures 4 degrees Celsius warmer than now, with sea levels tens of meters higher. The present-day location of Yale University was underwater. Many lines of evidence and study tell us about the effects of carbon dioxide release. In the past, large increases in carbon dioxide corresponded to major warming events. It is unwise to think that today’s increase in carbon dioxide will, for some reason, produce a different outcome." "The history of the Manufactured Doubt industry provides clear lessons in evaluating the validity of their attacks on the published peer-reviewed climate change science. One should trust that the think tanks and allied "skeptic" bloggers....will give information designed to protect the profits of the fossil fuel industry. Yes, there are respected scientists with impressive credentials that these think tanks use to voice their views, but these scientists have given up their objectivity and are now working as lobbyists. I don't like to call them skeptics, because all good scientists should be skeptics. Rather, the think tanks scientists are contrarians, bent on discrediting an accepted body of published scientific research for the benefit of the richest and most powerful corporations in history. Virtually none of the "sound science" they are pushing would ever get published in a serious peer-reviewed scientific journal, and indeed the contrarians are not scientific researchers. They are lobbyists. Many of them seem to believe their tactics are justified, since they are fighting a righteous war against eco-freaks determined to trash the economy." Of course, don't take my word for it. Do some research yourself, and not just from politically motivated sources. Global warming is clearly already affecting our planet, from massive ice loss from Antarctica, Greenland, and the mountain ranges around the planet, earlier and earlier springs, movement of species to higher latitudes and altitudes, larger and more intense wildfires in places like Australia and the western United States, and crippling droughts. As noted in the previous post, California has established two official state ghost towns, one for the gold rush, and the other for the "silver rush". Bodie, the official "California State Gold Rush Ghost Town", lies on a high windswept plateau in the barren hills east of the Sierra Nevada, far from any major population centers, at the end of a dirt road. It is the very essence of loneliness and solitude, and I could almost swear you can hear the tortured spirits moaning as you wander through. The state's official "State Silver Rush Ghost Town" could not be more different. To call it a "Disneyland in the Desert" is not far from the mark, although a "Knott's Berry Farm in the Desert" is far more accurate. Although it is a regional park under the auspices of San Bernardino County, it is really a tourist trap lying a couple of miles off the freeway running between Los Angeles and Las Vegas. You can drink sarsparilla in an old-time bar lined with paintings of the famous gunfighters, you can watch a gunfight in the streets, catch a melodrama in the theatre, buy trinkets in the gift shops, walk through the mysterious cabin where water flows uphill, tour the Maggie Mine, and ride the little train through the hills. You can stay overnight in the campground, complete with showers and hookups. And...Kenny Rogers once produced a two-record album about the place called the Ballad of Calico (for those of you unfamiliar with the concept, a "record" was an ancient pre-MP3 method of conveying music)..
Now, it sounds like I'm demeaning the place, but actually I like it a lot. The Kenny Rogers album, long out of print, is one of my most cherished possessions. My family spent a lot of time there, and I even did my senior thesis in the area. It is fun, but it is not "the Other California" of my current blog series. It's on too many postcards and tourist brochures. It turns out the "Other California" can be defined in a few different ways. The magic, to me, of Calico is beneath the surface of the town, and in the surrounding hills, the parts a lot of tourists never hear about. The ghost town is a genuine historic mining camp. Silver was discovered around 1881, and despite the horrific lack of water and blazing summertime temperatures, the town grew to a population of 1,200 before a drop in the price of silver killed the mines in the 1890's. There are claims that more than $20 million of silver was produced. The discovery of borates nearby caused a brief resurgence in 1907, but the town was abandoned within a few years. In 1951, the whole town was purchased by Walter Knott (there really is a close connection with the theme park). He took some of the buildings to Orange County to construct the core of his amusement park, but he also rebuilt some of the ruins, and made a tourist attraction in the desert as well. He donated the park to the county in 1966. Like Bodie, the town was threatened for a time by plans for renewed mining, and the large hill just west of town is criss-crossed with roads for the drilling rigs. The company was probably considering a large open-pit mine at the site. The scheme was eventually abandoned, probably because of low silver prices. So, what really is special about Calico and the Calico Mountains? That will be in the next post! The lands to the east of the Sierra Nevada are barren. In the rain shadow of the High Sierra, the hills to the east are dry, mostly treeless, and to many people, not particularly scenic or beautiful. During my days as a graduate student at University of Nevada, Reno, I came to have a different view. When trees are few, the trees that do exist take on a beautiful individuality. When a landscape seems monochrome, the eyes start to see the contrasts in the many shades of gray and green. Still, with hot summers and bitter cold winters, it doesn't seem to be the kind of place anyone would choose to live. But other factors come into play: the geologic history of these lands, the interplay of volcanic activity and the movement of faults and groundwater conspired to bring about the emplacement of gold in these barren hills. In the decades following the fabled Gold Rush, hungry miners started to explore these regions, and a lucky few found the elusive metal. W. S. Bodey was one of these; his exploration party found gold in 1859 in the hills between Aurora and Mono Lake, a plateau region averaging 8,000 feet above sea level. He may have found the gold, but he wasn't lucky. He froze to death the following year while making a supply run near Mono Lake. The mines took some time to take off. 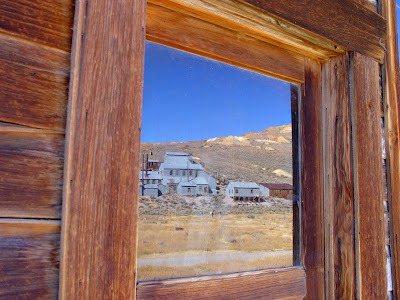 The discovery of a rich lode in 1876 led to the development of the Standard Mine, and thousands of people came to the town of Bodie (renamed for pronunciation purposes). The population peaked at 10,000 in 1880. The town developed a fearsome reputation for lawlessness, and one legend declared that a young girl, finding that Bodie would be her new home, said "Goodbye God, I'm going to Bodie". The town had its pride, too: an editor of the town newspaper insisted the punctuation was wrong; she had really said "Good, by God, I'm going to Bodie". The mines were active for years, producing $34 million in gold (at a mixture of prices, $20/ounce in the 1800's and early 1900's, and $36/ounce in the 1930's). The gold is worth a great deal more at today's prices, perhaps $1 or 2 billion. As time went on, gold production waned, and the town began to die away. The Standard Mine (visible in the window reflection in the picture below) shut down in 1913, although sporadic efforts at mining continued through 1942. A disastrous fire in 1932 destroyed most of the buildings in the town (only 167 of the original 2,000 buildings remain). 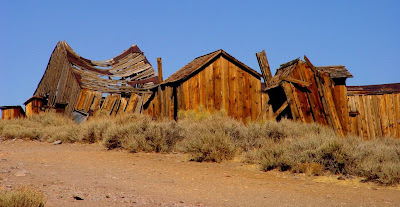 By 1962, concerns over vandalism led to the establishment of Bodie Historical State Park, and today the town is maintained as it is, with no new construction, and limited efforts to prevent damage to the remaining buildings (they call it "arrested decay"). The wood buildings have been windblasted in the severe winters, providing tourists with practically unlimited photographic opportunities. When the price of gold rose to atmospheric levels in the 1980's, interest grew in resuming mining at Bodie (despite the establishment of the state park, the mining claims were still valid). I remember some slick PR types visiting the surrounding communities in the 1980's promoting the jobs the mines would bring to the region. The new mines would of course require the removal of most of the mountain along the back of the town, and blasting and road traffic would no doubt damage the historic buildings. In the controversy that ensued, the state acted to remove the land from mineral speculation. Now the only threat to the park is the current state budget crisis. 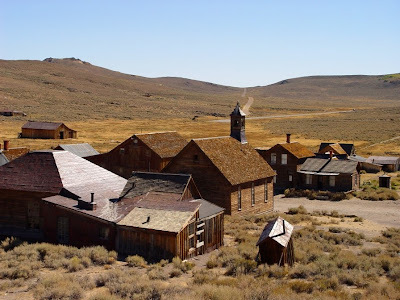 It was mildly surprising to me that Bodie would be the pick for the California State Gold Rush Ghost Town, given how many historic towns line the Mother Lode in the Sierra Nevada foothills (actually, until I started this series I didn't even know California had an official ghost town). On the other hand, the competition and politics would have been deafening. As it was, controversy did ensue, as southern California pushed for the inclusion of another ghost town in the Mojave Desert (see my next post). After some compromises the state legislature elected to declare a "gold rush ghost town", and a "silver rush ghost town". Bodie received its designation in as the gold rush town in 2002. If you are ever on Highway 395 between Mono Lake and Bridgeport, do not miss the side excursion to Bodie. Although part of the access road is unpaved, it is usually not a problem for passenger cars (winter is a different story). You won't regret it! A great resource on the establishment of Bodie as the state symbol can be found here. It links to some other excellent resources. A 1986 California Geologic Survey report on the geology of Bodie can be found here (also linked above). 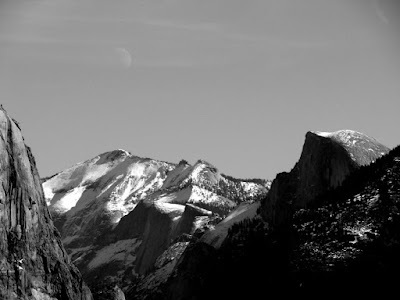 I was walking alone a couple of years ago in Yosemite Valley, on a surprisingly lonely trail between the visitor center complex and Yosemite Falls. Yes, I know all that about not hiking alone, but I thought it was a busy trail and a short distance. Just the same I was enjoying myself, having found a bit of solitude in a very busy park. Until I got spooked. It wasn't that I saw or heard anything. It was that I didn't hear anything. It had been a few weeks since a mountain lion attack somewhere in the state, and I was walking along these huge boulders that had fallen from the cliffs above, and any of them would provide a great hiding place for the big cats. Nothing happened, of course. My life has not been THAT interesting yet. But it got me thinking. Grizzly Bears have been extinct in the state since the 1920's. 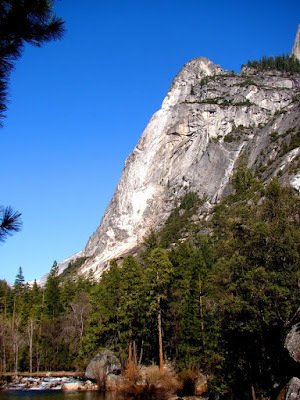 The remaining black bears have not caused a single fatality in Yosemite since the park was established (they have been a lot nicer to us than we have been to them). Despite a few newsmaking exceptions, cougars have not been much of a threat to humans. We have a better chance of dying from bee stings and car accidents. This has not always been the case in California. Prior to 12,000 years BP, our state would have been an intimidating place. Packs of Dire Wolves and American Lions roamed our prairies, seeking their prey from among the herds of horses, camels, antelope, bison, elk, mastodons, and mammoths. Short-faced bears, larger than grizzlies and polar bears, would have at least considered having you for lunch. In more forested and brushy areas, the large plant-eaters faced a threat from one of the most intimidating predators of all, the saber tooth cat (Smilodon californicus). 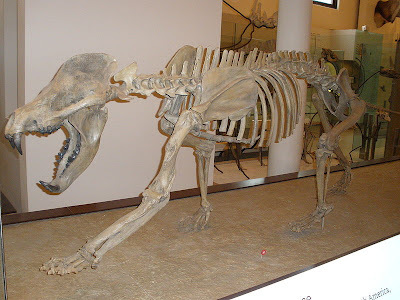 The Smilodon californicus was selected as the state fossil of California in 1973, beating out the trilobite species Fremontia fremonti for the honor. I understand the desire of many of the paleontologists to have a trilobite named the state fossil, but I must say I get a lot more oohs and ahs from elementary students when they see my Smilodon skull during their visits at the department. They are absolutely fascinated to find that the animal once lived, quite literally, in their backyards. So do I! California is a landscape of superlatives and extremes: the highest and the lowest points in the lower 48 states (Alaska: why do they leave her off these lists??). It has the hottest and driest deserts in North America, less than a day's drive from a contender for one of the snowiest places (Bear Valley once got 70 feet of snow in one year). We also have the oldest, tallest and biggest living things in existence, the Bristlecone Pine, the Coast Redwood (Sequoia sempervirens), and the Giant Sequoia(Sequoiadendron gigantea). The latter two of these trees are the California State Tree. Confusing? 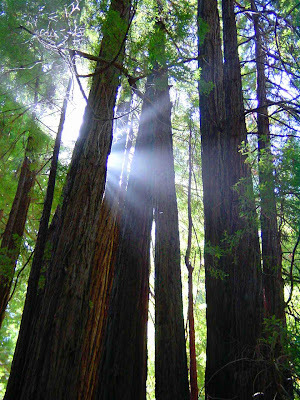 It turns out that the state legislature established the "native Redwood" as the state tree in 1937. But they didn't define what the "redwood" was: it took a decision by the state Attorney-General in 1951 to declare that both trees were the state tree. This was confirmed by the legislature in 1953. The Coast Redwoods are the tallest trees on the planet, with the current record-holder reaching 379 feet. They grow in the central and northern Coast Ranges, from Big Sur to just beyond the Oregon border. The durable wood is highly valued and lumbering has been going on for more than a century, so that only about 4% of the original old-growth forest remains in California. Efforts to preserve these remaining tracts have at times been controversial, but several beautiful national and state parks protect some of the remaining trees. The Giant Sequoia is a related species that exists today in 60 or so groves in the middle elevations of the western slope of the Sierra Nevada. These trees, though shorter (270 feet or so) are the largest living things in existence. The trees have massive trunks, sometimes more than 50 feet across, and the largest contain in excess of 50,000 cubic feet of lumber, enough to build 5 homes. The wood is too brittle for such use, and instead entire groves have been cut down to produce...grape stakes and pencils. Nearly all the remaining groves are now protected in state and national parks/monuments. A third species, the Dawn Redwood survives in China, in a single grove of no more than 5,000 trees that was discovered in 1944, and described in 1948. It had been thought to be extinct in the Miocene epoch. Although these trees are biological entities, they have a geologic aspect as well, that I discussed in a post some time ago. 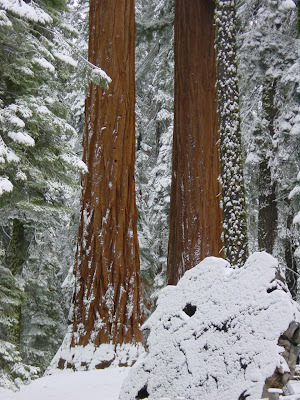 In short, the Sequoias and Redwoods have existed as a genus for 200 million years or more and once existed in groves across North America, Europe and Asia. The trees of Petrified Forest National Park were probably a related species, and I have this wonderful image in my mind of dinosaurs wandering among the giant trees. Yellowstone National Park has a series of Sequoia forests preserved in stone as well, dating to 30-40 million years ago. Other species of redwoods were apparently wiped out elsewhere in the world by climate change, especially the Pleistocene ice ages, but in the Sierra, they survived, barely, by propagating up and down the gentle western slope of the mountains as the climate alternated between glacial and interglacial periods. Some pollen work suggests they may have been on the very verge of extinction, but luckily for us they survived, and now are appreciated as the largest living things on the planet. I suspect the Coast Redwoods survived the ice ages protected by the moderating effects of the nearby Pacific Ocean.